Users of Apple (s aapl) magazine — and other reader — apps are likely to be repeat readers, seem willing to share their personal info with publishers, and appear to be more loyal than the average app downloader, according to a new report. The report is by YUDU media, which creates branded reading apps for the iPhone and iPad. Some of YUDU’s customers include Reader’s Digest UK, Newsmax Magaznine, and The College Journal. YUDU’s findings are good news for magazine publishers, for whom reader relationships are the backbone of a successful business. The broad category of “reader apps” includes catalogs, books and brochures in addition to magazines, but YUDU separates out these categories in its reports when differences between them are meaningful. The results are based on information gathered from 80 of YUDU’s branded client offerings, and reveal promising statistics regarding iOS publication uptake, use and engagement. YUDU found that more than 40 percent of iOS magazine app users were willing to supply their personal details when given the option. That nearly matches the 50-percent opt-in figure we heard earlier from Apple and publishers using the in-app subscription system Apple recently introduced to iOS. According to YUDU’s report, the percentage of users willing to share info with publishers of brochure and catalogs is only slightly less, with around 39 and 37 percent opting to provide info respectively. Note, too, that in the case of YUDU apps, this info must be manually entered in registration forms within the app, rather than shared via a simple dialog button press the way it happens through Apple’s built-in subscription system. That’s good news for publishers and marketers looking to use iPad publications as a means to gather valuable user data about its customers and subscribers. 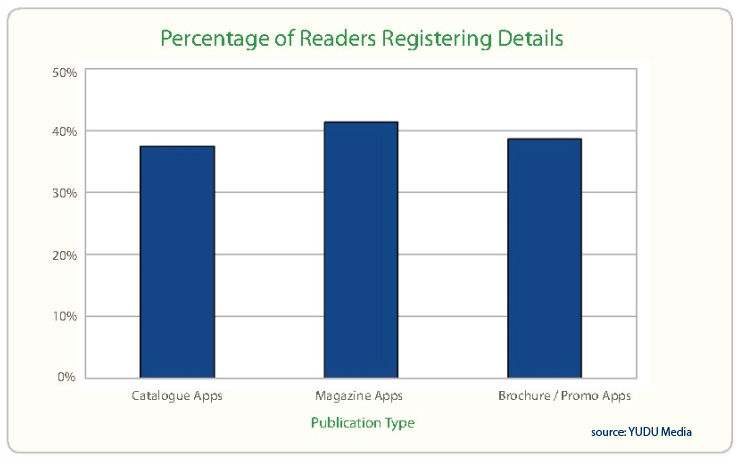 The reach of the App Store and the ease with which people can fill out these informational forms means that publishers can potentially reach a far broader audience with far less expense than with traditional print media. iOS magazine users are also becoming more and more engaged. YUDU found the time spent with iOS magazine apps has increased by 50 percent since YUDU started monitoring its app statistics. That period covers the release of 10 issues, a timeframe which varies slightly depending on which publication you’re looking at. YUDU maintains this is a factor of users becoming better acclimated to their iPad devices and the services available to them. Magazine apps also see a 64-percent user return rate, which means users of YUDU magazine titles are opening the apps more than once for the most part. On average, magazine app users come back 3.7 times. Update downloads also account for 33.2 percent of all magazine app downloads, which is a considerable percentage in an ecosystem where many apps are quickly deleted before an update even becomes available, according to YUDU. Finally, YUDU also identified two more promising trends for magazine app publishers. First, app downloads increase at a faster rate than device sales, which seems to show that the average user is buying more and more apps for their iOS devices over the course of the life of those devices, not less. Also, in-app purchasing is steadily increasing, too. While it doesn’t yet approach the revenue made from up-front sales, it’s trending upwards in 2011 so far. Apple is gaining a lot of support for its in-app purchasing system among publishers lately, despite early hesitation. The trends illuminated by YUDU might be a good indication why.